Callistus Obetta is the Group Executive, Technology and Services, First Bank of Nigeria Limited. 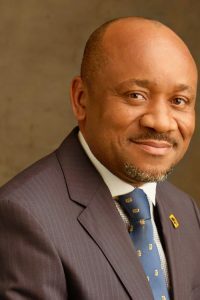 Until his appointment in July 2016, he was Chief Information Officer and Head, Group Technology and Operations at Standard Chartered Bank of Nigeria which he joined in 1999. Callistus has over 20 years’ experience spanning financial services, management consultancy and public consultancy. He possesses demonstrable skills in managing and leading large teams in the delivery of banking operations and technology management solutions that support complex products and services in a large emerging market. A Chartered Accountant and first class honours graduate from the University of Nigeria, Nsukka, Callistus holds an MBA degree from Manchester Business School and is an Honorary Senior Member of the Chartered Institute of Bankers of Nigeria. He commenced his career in 1991 in Arthur Andersen (now KPMG Professional Services), consulted for companies and undertook external audits and assurance services for many years before joining the banking sector. Callistus has collaborated with business stakeholders and led the delivery of major technology and operations projects. He has participated in various industry committees and is the current chairman of the CBN inaugurated banking industry IT Standards Council that advises the industry on the adoption of IT standards. Callistus enjoys coaching youths and young children, swimming, jogging and reading.